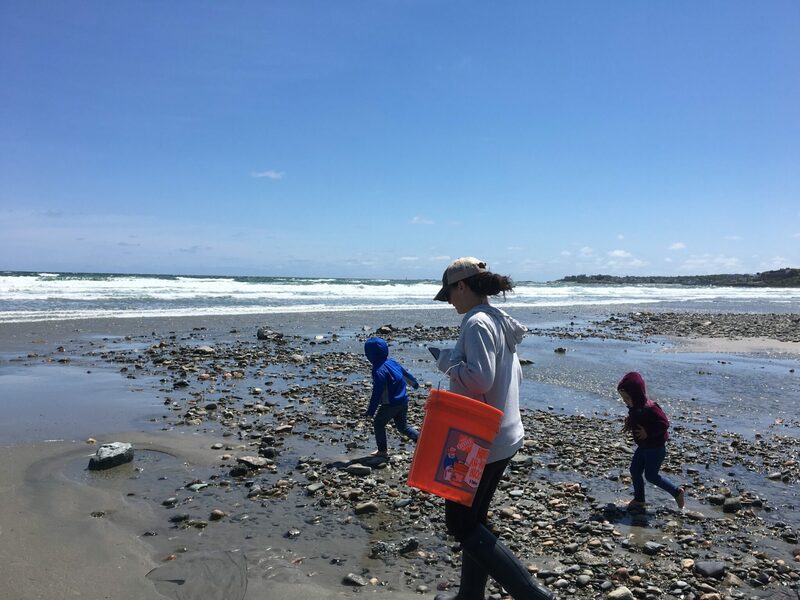 My two children and I recently went to our first Breakwater Blue beach clean up at Nantasket Beach. We brought our bucket and gardening gloves from home and started on the sidewalk. We picked up several pieces of trash before we even got onto the beach. I was pleasantly surprised by how clean the actual beach was but I know that is probably due to previous beach clean ups. We spent two hours combing the beach on a beautiful day, working together to clean up the beach. Beach clean-ups provide a great opportunity to talk about community service with kids. When I was explaining what we were going to be doing my son asked: “why is there so much trash and why don’t people care where it goes?” I have been a nature girl from a young age; I live for being outside, getting dirty, collecting bugs, and am an animal lover. However, life for moms gets so busy and my passion for the earth had taken a back seat. I must admit I now have days where I find myself in the drive-thru getting multiple coffees with plastic cups and plastic straws, sometimes even styrofoam so the condensation doesn’t bother me (cringe). I started thinking…it’s time for a change! My little ones are avid nature lovers as well. If we pass a field I often hear my son say “Mom, that field is so beautiful.” He is so right, and I want to help him learn how to preserve it! Being a nature lover and having two tiny nature lovers on my hands has made things such as teaching composting more enjoyable. This past spring we used our composted dirt in our garden and our flowers are looking better than ever! We talk about what gets recycled versus what gets thrown in the trash and what happens with the recycling. When I saw recently on the news the story about the whale who washed ashore whose stomach was filled with plastic bags and other trash it made me sick to think of how careless we have become. We take so much pride in doing what’s best for our kids, yet taking care of the earth we live on should be on the top of the list – and sometimes it’s not. Taking care of our earth is something we should take pride in doing and teaching our little ones about! If you don’t already recycle, START! Get a compartmentalized lunchbox for your children to avoid endless Ziploc baggies. Head to a beach clean-up or take a hike in a park and bring along a trash bag to collect garbage on the trail. Follow Breakwater Blue for more information on local beach cleanups. We are excited to be collaborating an Over The Moon Parenting Beach Clean in the fall, so stay tuned! They also encourage people to do Trash walk Tuesdays! Take 30 minutes or less to walk your neighborhood or beach to pick up trash. Take a photo and tag @breakwater blue and use hashtag #trashwalktuesday #bbluecleanup and you will be featured on the Breakwater Blue website. Another great idea they suggest is #take3 where you take three pieces of trash you didn’t bring from the beach to help keep it clean. *Please make sure that during any sort of clean ups you and your little ones wear gloves. It is also helpful to show images of things you wouldn’t want them to pick up and stay close to them. Use a beach clean up and nature walk as a learning tool and get the conversation going about the importance of keeping the earth clean.